Fit & Well gives students the knowledge and skills they need to make meaningful and lasting behavior change. The new edition combines proven science-based content and digital teaching and learning tools with the exciting introduction of liveWell - an innovative online multi-media program designed to help college students improve their exercise eating and stress management habits.Fit & Well motivates students through science - Fit & Wellâ€™s respected text which is available both in print and as an integrated multimedia eBook provides the information students need to start their journey to fitness and wellness. 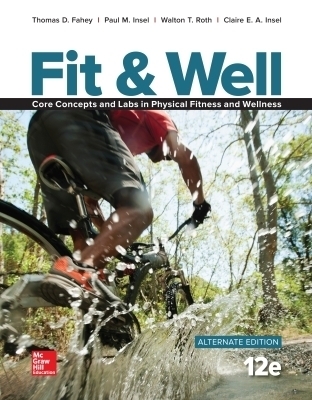 Fit & Wellâ€™s authoritative science-based information is written by experts who work and teach in the field of exercise science physical education and health education. Fit & Well provides accurate reliable current information on key health and fitness topics while also addressing issues related to mind-body health research diversity gender and consumer health. Fit & Well motivates students through personal engagement â€“ The Fit & Well learning system uses the online technologies and multimedia tools that have become an integral part of studentâ€™s college experience. Fit & Wellâ€™s engaging online tools enable students to personalize their learning and develop fitness programs and lifetime wellness plans. Hands-on activities include self-assessments and fitness labs video on timely health topics such as tattooing and tanning beds exercise demonstrations videos a daily fitness and nutrition log sample programs and a wealth of behavior change tools and tips. Fit & Well builds research skills critical thinking skills and behavior change skills.Fit & Well motivates students through Connect and LearnSmart â€“ Tied to core student learning outcomes and objectives Connect Fit & Well is a web-based assignment and assessment platform that promotes active learning and provides tools that enable instructors to teach the course more efficiently and effectively. An integrated multimedia eBook the unparalleled LearnSmart adaptive assessment program and a wealth of other online activities assessments and behavior change tools engage students using technologies that most students use on a daily basis. Using Connect instructors can easily assign pre-loaded activities create and edit assignments produce video lectures upload their own articles or videos cascade assignments and produce reports for one or many course sections. Connect is the only integrated learning system that empowers students by continuously adapting to deliver precisely what they need when they need it and how they need it so that your class time is more engaging and effective.